Somebody has some experience with remanufactured Volvo calipers from Cardone, Centric, Beck Arnley, Raybestos, that can be found on eBay? Im in doing the Volvo 4 pots from EvilBay at the moment. Looks to be good quality, and I havent had any isues other then the known sloting etc we already know needs doing. The caliper came in a box branded Bosch, but the casting on the caliper says ate. Dosent realy matter to me, both Bosch and ate are good known brands. Fully agree. Already fitted now? During the trip in the Eifel of last week I mentioned the brake upgrade to some people and at least one (me) is interested. I would like to look at it as a good, nice and scaleable solution and I generally don't like sitting on knowledge so I share drawings without any problems. The problem is of course that we drive our cars to fast and that the solution is to drive slower, but I'm not an engineer to solve things that way. I have a stock setup with solid discs and Ferodo 2500 pads. The amount of thermal mass in our discs is relative small, cooling things down can help of course by using the vanes of the 323i. But I feel fading at about the same moment as the stock 323i that I was tailing. Thegs (with his red 323i) mentioned that he feels fading at about the same moment that Jeroen (with his Wilwood Powerlite and stock discs setup) feels. So to have more thermal mass and to be able to use modern disc technology my suggestion is to move to two piece rotors. In that way everybody can choose their own rotors, slotted, drilled, 279mm or 356mm or whatever. The only thing is that hearts are needed. No big invention, Massive and IE et al sell these kits. But I am not willing to pay that much money. 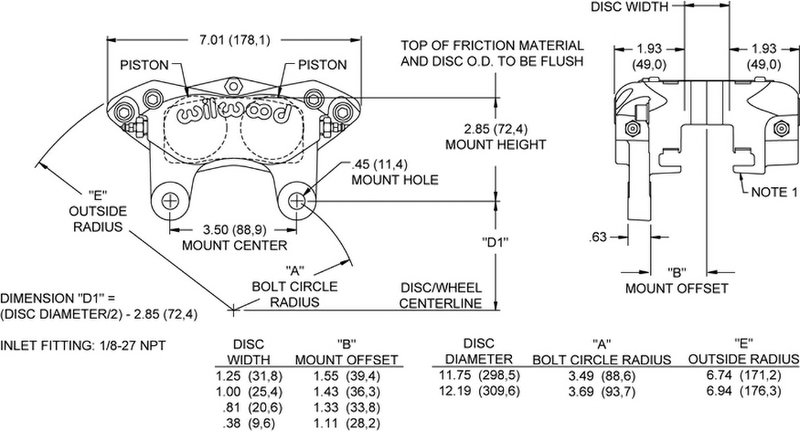 The Wilwood calipers are dimensioned in such way that a bracket to fit the caliper is easy to parameterize. I think I can set up a group buy to make these brackets but if someone in the future wants to make it themselves, just take the fitted rotor diameter, calculate a dimension and send the drawing to a machine shop. To select things this info is needed: Rotor diameter, rotor width, radial or normal mount, number of pistons and piston area and pad area. 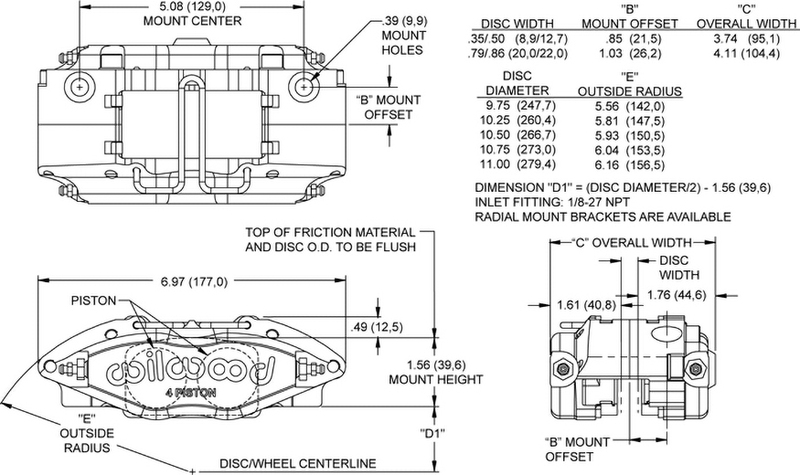 This forum has some experience with the Powerlite caliper (120-8729). These can take maximum 279 (11") discs, 21.8mm width (0,86"), radial mount, 4 pistons width 19.35cm2 (3in2) and pad area is 11,6cm2 (1.8in2). For simplicity reasons I like the 'normal' way of mounting a caliper, I would like not to be limited by the diameter and I'll accept the 20.6-21.8mm (0.81-0.86") width, however wider is absolutely an option of course. When a bracket is needed, strength will be an issue and this thing is designed with a large mounting height, which makes the bracket less complicated. It is available for 20.6 (0,81"), 25.4 (1") and 31.7mm (1.25") wide discs. Pad area is 19.35cm2 (3in2). Max disc diameter is 323mm (12.72"). Diameters are 273 (10.75) and 279mm (11"). Where the diameter explodes in our face with 327mm (12.88"). It is one or another. The bolt pattern of the 0.81 and 1.25 is different and of course the height of the heart. I don't know. If one invests, one wants to do it good. The price of 31.7mm stuff is not more or less than for 20.8mm stuff. I don't know about clearances, but I would like to go for 31.7mm wide rotors, if it fits. 298mm (11.75") diameter is not too crazy and I guestimate that it fits 15". The inside of the disc is fixed, the wider it becomes, the closer it comes to the rim. So it would be nice to have a small survey how much space there is between the inside of the rim and the outside of the disc, most of us are on 15" Alpina and I am at 15" BBS Mahle. Next thing... The hearts. Most often they are made of aluminium. The rotor is cast iron and screws and bolts are often ferritic as well. The latest months I have become aware of galvanic corrosion. The calipers' aluminium is painted or anodized so it is isolated. Hearts could be protected as well, but it does not seem to be sustainable to me, the smallest scratch could be catastrophic (the smaller the contact area, the quicker the corrosion). The hearts can be isolated as well by other means (plastic washers and so) but I don't know. Maybe I see bears on the road where there are no bears, but I would make the hearts out of steel. I mocked up something on my work pc and with 279mm rotors I ended up with the same weight as for stock 255mm 323i discs. Please: shoot, discuss and improve my writeup. You may want to look at my setup, 296mm x 22mm (E39) discs with the wilwood superlite caliper. fits inside MSW & Mahle 15" wheels. Will not fit inside MIM 15". The powerlite is only really n upgrade in terms of weight (unsprung mass), in fact the pad is smaller than the stock E21. I preferred a set of aluminium alfa twin pots over the powerlites I tried afterwards. But the superlites a a big step in pad size and bite. Ow wauw, what a difference! Do you have the 20.6 or the 27.9 version? The bracket looks really sleek. Later I read that, of course, the braking force increases with the diameter, so less heat is generated anyways for the same braking effort. You don't want the disc to cool like a maniac either, so maybe it works out with the 20.8mm width setup. What do you think? Do you use them on the track with one of your S54 beasts? Do you get these discs to cook? And actually, this totally fits to a modular system. The end user can choose self what caliper to buy, the same bracket can be used!